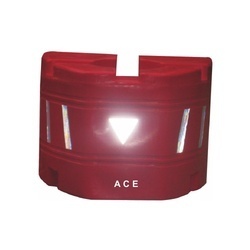 Leading Manufacturer of safety nose from Faridabad. Providing for superior visibility, these Safety Nose options are also light in weight, thus making them easy to handle and move as desired locations. Ashighly preferred choice for barricading of traffic, these support channeling and directing vehicular/pedestrian traffic at areas like construction sites, places of accidents and others. Further, these also come with support of reflective bands that provide for enhanced visibility at night. Being easy to install these are suitable for areas like commercial spaces, institutional areas, parks and are made available in length of 1200 mm, width of 480 mm (front) & 1370 mm (back), back height of 1000 mm & front height of 970 mm and water ballast of 1100 Ltrs. Available in LLDP construction using technically advanced Roto molded process, these Safety Nose (Night View) are UV stabilized as well as feature non fading color coating so as to provide for long lasting support. Finding use in applications like creating of divider, median at intersection or places like tollbooth plaza, these feature water barrier support which helps in saving human lives. Further, its high night time visibility is suitable for guiding traffic as well as making people aware of the ongoing construction projects, thus eliminating possibilities of causalities. 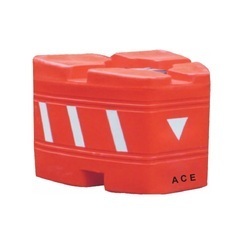 These are suitable to be used empty/ ballasted with water/sand with use as interconnection/ spacing to clearly delineate the path. As these are made using high molecular weight high-density plastic, these are also strong in finish in comparison to other similar plastic products.